Despite tremendous hardship which the Venezuelan people are having to face, despite the sanctions and intimidation from abroad, President Nicolás Maduro has won a second six-year term. True. Both nations, Venezuela and Syria, are separated by a tremendous geographical distance, but they are united by the same fate, same determination and courage. During the Spanish Civil War, Czech anti-fascist fighters, volunteers in the International Brigades, used to say: “In Madrid we are fighting for Prague”. Madrid fell to Franco’s fascists in October 1939. Prague had been occupied by German troops several months earlier, in March 1939. It was the blindness and cowardice of the European leaders, as well as the support which the murderous fascist hordes received from populations of all corners of the continent, which led to one of the greatest tragedies in modern history – a tragedy which only ended on May 9, 1945, when the Soviet troops liberated Prague, defeating Nazi Germany and de facto saving the world. More than 70 years later, the world is facing another calamity. The West, mentally unfit to peacefully end its several centuries long murderous reign over the planet – a reign that has already taken several hundreds of millions of human lives – is flexing its muscle and madly snapping in all directions, provoking, antagonizing and even directly attacking countries as far apart as North Korea (DPRK), China, Iran, Russia, Syria and Venezuela. What is happening now is not called fascism or Nazism, but it clearly is precisely that, as the barbaric rule is based on a profound spite for non-Western human lives, on fanatical right-wing dogmas which are stinking of exceptionalism, and on the unbridled desire to control the world. Many countries that refused to yield to brutal Western force were recently literally leveled with the ground, including Afghanistan, Libya and Iraq. In many other ones, the governments were overthrown by direct and indirect interventions, as well as deceit, as was the case in the mightiest country in Latin America – Brazil. Countless “color”, “umbrella” and other “revolutions” as well as “springs” have been sponsored by Washington, London and other Western capitals. But the world is waking up, slowly but irreversibly, and the fight for survival of our human race has already begun. 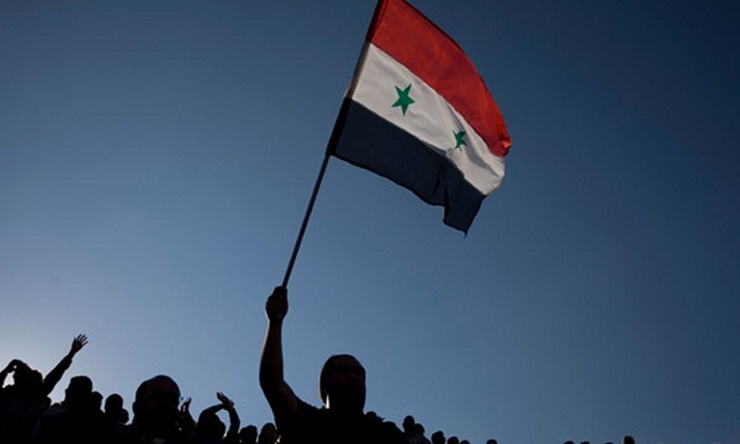 Venezuela and Syria are, unquestionably, at the frontline of the struggle. Against all odds, bleeding but heroically erect, they stand against the overwhelmingly mightier force, and refuse to give up. “Here no one surrenders!” shouted Hugo Chavez, already balding from chemotherapy, dying of cancer which many in Latin America believe, was administered to him from the United States. His fist was clenched and heavy rain was falling on his face. Like this, died one of the greatest revolutionaries of our time. But his revolution survived, and is marching on! I am well aware of the fact that many of my readers are from the West. Somehow, particularly in Europe, I cannot explain, anymore, what it really is to be a revolutionary. Recently I spoke at a big gathering of ‘progressive’ teachers, which took place in Scandinavia. I tried to fire them up, to explain to them what monstrous crimes the West has been committing all over the world, for centuries. I tried and I failed. When the lights went on, I was drilled by hundreds of eyes. Yes, there was an applause, and many stood up in that fake cliché – a standing ovation. But I knew that our worlds were far apart. What followed were pre-fabricated and shallow questions about human rights in China, about “Assad’s regime”, but nothing about the collective responsibility of people of the West. To understand what goes on in Syria and in Venezuela, requires stepping out of the Western mindset. It cannot be understood by selfish minds that are only obsessed with sexuality and sexual orientation, and with self-interest. There is something essential, something very basic and human that is taking place in both Syria and Venezuela. It is about human pride, about motherland, about love for justice and dreams, about a much better arrangement for the world. It is not petty, in fact it is huge, and even worth fighting and dying for. In both places, the West miscalculated, as it clearly miscalculated in such ‘cases’ as Cuba, Russia, China, Iran, DPRK. Profit is not everything. Personal gain is not everything. Selfishness and tiny but inflated egos are not everything. Justice and dignity are much more. Human ideals are much more. To some people they are. Really, they are, trust me – no matter how unreal it may appear in the West. Syria is bleeding, but it refused to surrender to the terrorism injected by the West and its allies. Aleppo was turned into a modern-day Stalingrad. At a tremendous cost, the city withstood all vicious assaults, it managed to reverse the course of the war, and as a result, it saved the country. Venezuela, like Cuba in the early 90’s, found itself alone, abandoned, spat at and demonized. But it did not fall on its knees. In Europe and North America, analyses of what is happening there have been made “logically” and “rationally”. Or have they, really? Do people in the West really know what is like to be colonized? Do they know what the “Venezuelan opposition is”? Do they know about the consistency of the terror being spread by the West, for centuries and all over Latin America, from such places like the Dominican Republic and Honduras, all the way down to Chile and Argentina? No, they know nothing, or they know very little, like those Germans who were living right next to the extermination camps and after the war they claimed that they had no idea what that smoke coming up from the chimneys was all about. There is hardly any country in Central or South America, whose government has not at least been overthrown once by the North, whenever it decided to work on behalf of its people. And Brazil, last year, became the ‘latest edition’ of the nightmares, disinformation campaigns, ‘fake news’ and coups – being spread with ‘compliments’ from the North, through local ‘elites’. You see, there is really no point of discussing too many issues with the ‘opposition’ in countries such as Venezuela, Cuba or Bolivia. What has to be said was already pronounced. What goes on is not some academic discussion club, but a war; a real and brutal civil war. I know the ‘opposition’ in South American countries, and I know the ‘elites’ there. Yes, of course I know many of my comrades, the revolutionaries, but I am also familiar with the ‘elites’. All this may sound ‘irrational’, even directly against their own capitalist gospel. But they don’t care about rationality, only about power. And their handlers from the North will compensate their losses, anyway. There is no way to negotiate, to debate with these kinds of people. They are traitors, thieves and murderers. For years and decades, they used the same strategy, betting on the soft-heartedness and humanism of their socialist opponents. They dragged progressive governments into endless and futile debates, then used their own as well as Western media to smear them. If it did not work, they choked their own economies, creating deficits, like in Chile before the 1973 Pinochet’s coup. If that did not work, they’d used terror – naked and merciless. And finally, as the last resort – direct Western interventions. They are not in it for ‘democracy’ or even for some ‘free market’. They are serving their Western masters and their own feudalist interests. To negotiate with them is to lose. It is identical with playing the game by their own rules. Because behind them is the entire Western propaganda, as well as financial and military machinery. The only way to survive is to toughen up, to clench teeth, and to fight. As Cuba has been doing for decades, and yes, as Venezuela is doing now. This approach does not look ‘lovely’; it is not always ‘neat’, but it is the only way forward, the only way for progress and revolution to survive. Before Dilma got ‘impeached’ by the pro-Western bunch of corrupt freaks, I suggested in my essay that was censored by Counterpunch but published by dozens of other outlets world-wide, in many languages, that she should send tanks into the streets of Brasilia. I suggested that it was her duty, in the name of the people of Brazil, who voted for her, and who benefited greatly from the rule of her PT. She did not do it, and I am almost certain that now she is regretting so. Her people are once again getting robbed; they are suffering. And the entire South America is, as a result, in disarray! Corruption? Mismanagement? For decades and centuries, the people of Latin America were ruled and robbed by the corrupt bandits, who were using their continent as a milking cow, while living in the repulsive opulence of the Western aristocracy. All that was done, naturally, in the name of ‘democracy’, a total charade. Venezuela is still there – people are rallying behind the government – in terrible pain and half-starving but rallying nevertheless. It is because for many people there, personal interests are secondary. What matters is their country, socialist ideology and the great South American fatherland. Patria grande. It is impossible to explain. It is not rational, it is intuitive, deep, essential and human. Those who have no ideology and ability to commit, will not understand. And, frankly, who cares if they will or not. Hopefully, soon, both Brazil and Mexico – the two most populous nations in Latin America – will vote in new left-wing governments. Things will then change, will become much better, for Venezuela. Until then, Caracas has to rely on its far-away but close comrades and friends, China, Iran and Russia, but also on its beautiful and brave sister – Cuba. Evo Morales recently warned that the West is plotting a coup in Venezuela. Maduro’s government has to survive another few months. Before Brazil is back, before Mexico joins. It will be a tough, perhaps even bloody fight. But history is not made by weak compromises and capitulations. One cannot negotiate with Fascism. France tried, before WWII, and we all know the results. When one defends his country, things can never be tidy and neat. There are no saints. Sainthood leads to defeat. Saints are born later, when victory is won and the nation can afford it. Venezuela and Syria have to be supported and defended, by all means. These wonderful people, Venezuelans and Syrians, are now bleeding, fighting for the entire non-Western and oppressed world. In Caracas and Damascus, people are struggling, battling and dying for Honduras and Iran, for Afghanistan and West Africa. Their enemies can only be stopped by force. In Scandinavia, a Syrian gusano, who lives in the West, who smears president Assad and gets fully compensated for it, challenged me, as well as the Syrian ‘regime’ and Iran, during the Q/A session. I said I refuse to discuss this with him, as even if we were to spend two hours shouting at each other, in public, we would never find any common ground. People like him began the war, and war they should get. I told him that he is definitely paid for his efforts and that the only way for us to settle this is ‘outside’, on the street. Venezuela and Syria cannot fall. Too much is now at stake. Both countries are presently fighting something enormous and sinister – they are fighting against the entire Western imperialism. It is not just about some ‘opposition’, or even the treasonous elements in their societies. This is much bigger. This is about the future, about the survival of humanity. Billions of people in all parts of the world have been closely following the elections in the Bolivarian Republic. There, the people have voted. President Maduro won. He won again. Scarred, bruised, but he won. Once again, socialism defeated fascism. And long live Venezuela, damn it! Is Washington at the End of the Rope with Venezuela? Copyright © 2019 The 21st Century. All Rights Reserved.